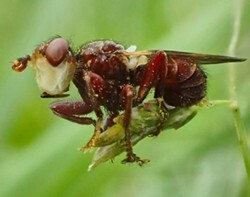 A thick headed fly killed by fungus. It rained the other morning, giving me an excuse to not mow and enjoy the little English lawn daisies a little longer. Small flowers attract small critters and there was drama aplenty among the blades of grass. First off, the zombie dung flies (Scathophaga stercoraria) are back right on schedule. The fungus Entomophthora muscae infects some species of flies, driving them to land on a tall blade of grass, lock up and die there to distribute spores continuing the fungi's life cycle. A little farther and I found a thick headed fly of the family conopidae, apparently deceased by the same disease. These are known to be parasitoids of wasps and bees. Just a bit more and a tiny fly on one of the English daisies moved strangely, so I investigated. The tiniest crab spider (family thomisidae) I've ever seen was dragging it over the edge of the flower by the neck. The spider's body was smaller than the head of a pin. A fly so small sometimes I wonder how they can exist, landed on the tip of a blade of grass. I took the picture, and it flew away. Only upon reviewing it on my computer screen did I notice it was being parasitized by an even smaller mite. It's been a long, wet and cold March, but one sunny day brought out the early spring butterflies. I watched half a dozen California tortoise shells (Nymphalis californica) feed and chase each other among the flowers clothing my green gage plum trees. I'm not sure if these aerial acrobatics were part of a mating ritual or a territorial dispute. Most of the individuals I saw showed a little wear which could have been from either activity. This rust and black species can have several generations in a year. In especially good years their populations can explode into swarms. Fortunately their larvae feed on non-crop items and so aren't in direct competition with humankind. Armed with cameras, I took a walk along "my stretch" of the Van Duzen River. Along the way, margined whites (Pieris marginalis) patrolled over the milkmaids in open areas. Like their close relative and common garden pest the cabbage butterfly (Pieris rapae), their larvae dine on members of the mustard/cabbage family of plants. 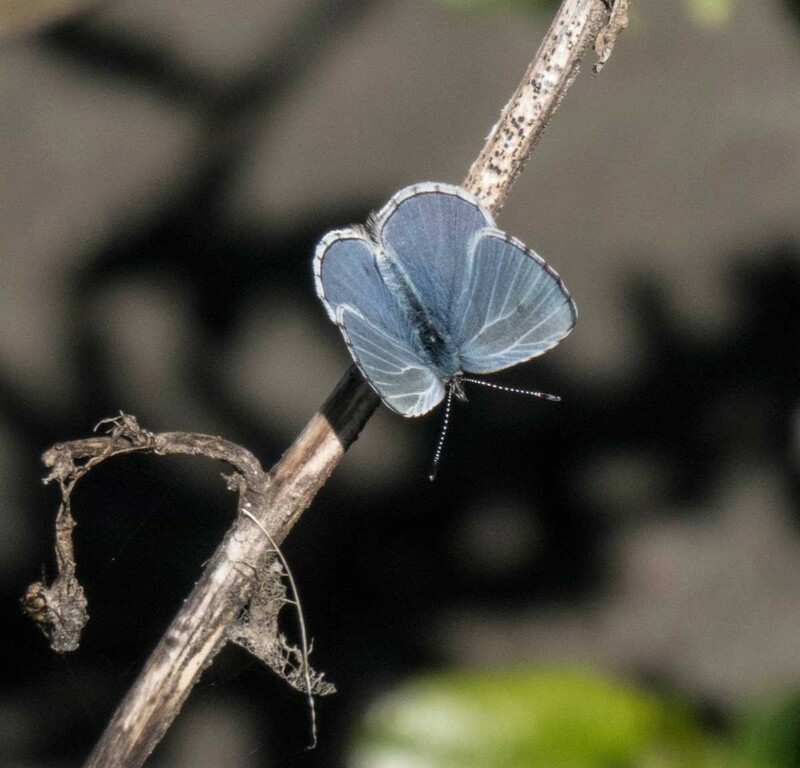 Along the river, I followed several tiny blue butterflies. They frequently landed in damp sandy areas with wings closed showing their light gray and speckled underwings. Finally one landed on a twig and went into "display mode," showing off its pretty blue upper wing surfaces. I was able to identify it as an echo blue (Celastrina echo), another locally common species that has multiple generations per season. Their larvae and pupa are believed to have a symbiotic relationship with some species of ants. The destruction of ant habitat in the San Francisco dune areas resulted in the extinction of the Xerces blue, a closely related species. Last but not least, I was pleasantly surprised when a flash of yellow and black dove into the willow thicket I'd been watching. It was one of my favorite butterflies, the anise swallowtail (Papilio zelicaon). Its wings were pristine and brightly colored, so I guess it had only recently emerged from its chrysalis. By swallowtail standards, this species is never large and this specimen was the smallest I've seen, leading me to believe it hadn't been a good autumn for foraging among the stands of anise on which, as a caterpillar, it fed. Once again the trip left me with more questions than answers, like a good walk should.